We've launched our #KidsandKitties campaign today to encourage parents to keep their pets during pregnancy after a survey found that over half of prospective mums and dads have concerns. 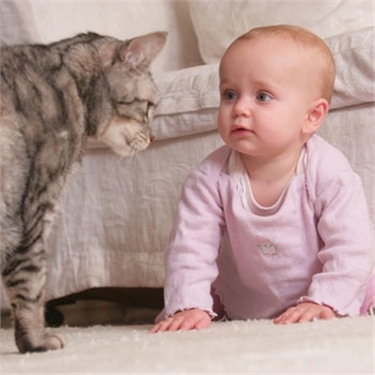 The survey outlined that 1 in 12 parents gave up their cat because of having a baby or young children, while two thirds of these regretted their decision. The campaign offers advice to parents on how to keep their children, cats and themselves safe and happy as well as outlining the benefits of pets in families. We recieve hundreds of calls each year from people wanting to give up their cats for reasons related to children and babies. Daniel Cummings, Cats Protection's Behaviour Officer said: "There seems to be a lot of conflicting advice out there about cats, pregnancy and children so we're keen to stress that you don't need to give up your cat if you are pregnant or have young children." He continues: "With just some simple considerations, cats and children can live in harmony together and this can bring huge benefits such as helping kids to learn responsibility and compassion for living things."